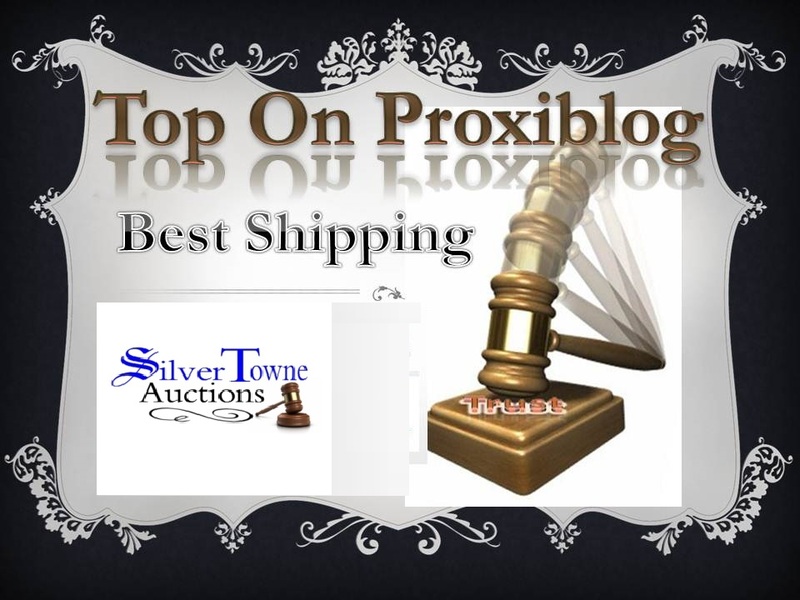 SilverTowne Auction and Capitol Coin Auction win the shipping category because they send winnings to buyers without charging handling fees or higher fees for each additional lot (a practice that baffles us because the more lots a customer wins, the better for the house and Proxibid). Shipping Instructions: All items will be shipped via the U.S. Postal Service. The Buyer is responsible for the actual cost of shipping and insurance. Unlike most other auction companies, we DO NOT charge our buyers a fee for handling or packing their purchases. All items are shipped within 2-3 business days following the auction. Some auction houses on Proxibid refuse to ship in-house, using third parties that require your credit card data (unsafe practice) or charge ungodly fees for coins, even though supplies are free at the US Post Office. Take a look at this post about one such company. Coins and jewelry will be shipped via United States Postal Service to locations in the United States at a flat rate of $10 (shipping, and handling) for most orders, which will be added to your invoice. … All packaging is done by Engstrom Auction employees. We double check your items against our packaging slip to ensure you get the correct items. Shipping Instructions: Buyers will pay actual shipping cost with no handling fee. Shipping will be within 2 business days of receipt of payment for item (items) purchased. Your credit card will be charged for shipping at this time. We will ship coins anywhere in the world and shipping will cost accordingly. Multiple items will be combined to save shipping costs when applicable. Shipping Instructions: We provide fast low cost shipping to our bidders. We ship most items for $4 or less for all items won. Sometimes additional postal services or insurance may be added to the invoice if need, based upon value, weight, size and destination. Shipping Instructions: Minimum shipping charge for is $2.00 and the prices will be adjusted with the number of items that you purchase. The prices do not double or triple, but reflect the weight shipped and the distance that they are shipped. For more information you may log onto http://www.usps.com for shipping rates and zone information. We insure packages up to the purchase price. Shipping Instructions: Packages valued under $100 are sent uninsured via USPS First Class Mail or Priority Mail; packages valued at $100 to $499 are sent via USPS Insured at the buyer’s risk; packages valued at $500 or more are sent via USPS Registered Mail. Shipping is charged at the USPS published rates. We congratulate SilverTowne and Capitol Coin Auction and our Honorable Mention houses for their emphasis on shipping inexpensively, quickly and securely. This entry was posted in TOP Awards and tagged Capito Coin Auction, Engstrom Auction, Five Star Auction, Meares Auction Group, SilverTowne Auctions, Star Coin and Currency. Bookmark the permalink.